Sacramento native Lucas Bere graduated from Berklee College of Music in Boston with a Bachelor of Music in Performance. There, he studied with Shannon LeClaire, Jim Odgren, Dino Govoni, Frank Tiberi, Wendy Rolfe, Christian Li, Doug Johnson, and Edmar Colon. He was a member of the Berklee Concert Jazz Orchestra directed by Greg Hopkins, as well as in ensembles directed by Jason Palmer, Terrence Blanchard, and Dave Santoro. Prior to attending Berklee, Lucas was a Fellow at the Brubeck Institute where he studied and/or performed with Stefon Harris, Joe Gilman, Ed Simon, David Henderson, and Matthew Krejci. As part of the Brubeck Institute Jazz Quintet, he performed at Dizzy’s Club at Jazz at Lincoln Center, the Monterey Jazz Festival, and many other venues across the country. 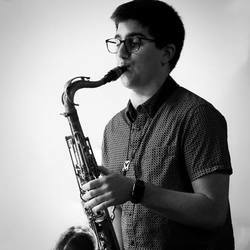 While at the Brubeck Institute the Quintet received a DownBeat Award for Best College Combo in 2016, and members including Lucas were part of the winning jazz combo in the college division at the Monterey Next Generation Jazz Festival in 2015. Lucas is also a graduate of Rio Americano High School. During his time there, he performed at the Essentially Ellington Festival three times, was a member of the winning combo at the Charles Mingus Festival, and performed at the Monterey Next Generation Jazz Festival. While his primary focus is on jazz, Lucas has also studied classically and performed in / composed for a variety of musical contexts, ranging from film scores to folk music, R&B, gospel, pop, video game music, and much more.